You took the prenatal yoga classes. You take Baby & Me, but what’s next!? You are committed to your baby’s health and development, but what about your own? Finding just that hour or so for your own self care is critical. Not only are you demonstrating healthy habits for your kids, but you deserve it. You deserve time to be an individual, be around other adults, and feel fit. This can be done without having to deal with the stresses of childcare. We are really excited to start this fall initiative for parents- drum roll please! Refresh Yoga Center now offers child minding during morning classes on weekdays. Our child minding program is designed to help moms, dads, grandmas, and grandpas get in their workout regularly without have to worry about finding a sitter. Because parents are on site, this is not the same thing as childcare, but it still means you can have an hour or so to take care of yourself while a responsible adult keeps an eye on your little one. Currently this service is available on Wednesday and Friday mornings. We will be expanding the program to six days a week in the near future, so keep watching the schedule for additional time slots that you can make it to class without scheduling separate childcare or daycare. Parents will take class in the front studio while their children enjoy activities in the back! Our CPR certified staff is there to provide supervision. Being in the same place as your child means you will always be able to check on and interact with your child as needed. You must remain on the premises at all times. Ideally, you will be able to enjoy your class without interruption but there may be times we need to pull you from class to console or talk to your child. Children must be between 6 months and 10 years old. You can reserve your child’s spot like you are booking a class through the website. Passes are sold as singles or in 10 class packages. If it is your first time bringing your child, you will be asked to sign a separate liability waiver. We ask that children are fed and changed, or taken to the bathroom, prior to dropping them off. Refresh Yoga Center staff does not administer medicine or discipline children. There will be toys and games and of course yoga props to play with! LeeAnne Pena, barre extraordinaire, co-owner, and mother of two will be there on some days. On other days is Lindsey Canalay, prenatal teacher, co-owner, and mother to an energetic toddler, will be there on others. Both of them are CPR certified with lots of child watching experience. As we grow the program, you can expect other highly qualified personnel to mind the children. You are welcome to come meet any of our child minders prior to dropping off your child. We want you to feel as comfortable as possible. Refresh Yoga Center is your retreat from a hectic world. 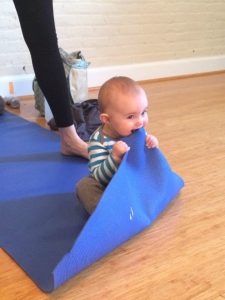 We are committed to serving the parents of Old Town Alexandria and surrounding neighborhoods on their journey to a healthy life through yoga, fitness, and community. Find us on King Street near the Torpedo Factory. We offer prenatal yoga classes and postnatal workshops as well as Baby & Me several times a week. You are bound to find something that meets your scheduling and childcare requirements! For those who are anxious to improve fitness as soon as possible after giving birth, we offer bootcamp three days a week at 6 AM. It’s a wonderful way to knock out that workout and get on with your day. Balance the yang with some yin with our restorative and stretch class offerings. Our location is perfect for those in DC, Arlington, Fort Belvoir, Oxon Hill, National Harbor, Springfield, Belle Haven, and Belle View.